I have adored animals from a very early age, especially dogs and heavy horses and I had a picture in my head of the perfect horse should I ever be fortunate to afford one. 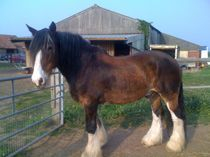 In 2005 when my Son, Jack was young, I resuced a pony from the abatoir. He was scared of everything and had never been handled properly so for 2 weeks Jack and I worked with him gaining his trust and breaking him in to ride and he turned out to be the sweetest horse who wasn't afraid of anything, he learnt how to do mounted games and loved it ! Not long after I homed Ceasar, I walked around the corner and saw him standing there and it was like the image in my head of all those years before of my perfect horse standing in front of me. He was the biggest and most handsome horse I had ever seen and he knew it lol. I had him for 6 years and in that time the bond we formed was one that I know I will probably never experience again. We used to hack out all around the villages and people used to take pictures of him as we walked past their houses. We went to a couple of showing shows and he thought everyone was there to look at him and proper showed off, he was hilarious. When he was given a rosette for reserve champion he was swishing his mane and I know he just knew he had won! He didn't like anyone else putting him in and out of his field and certainly didn't like anyone else talking to me when I was up the yard as clearly I was there only to see and look and talk to him, how dare I talk to anyone else lol. He loved extra strong mints and milky ways and would give you a kiss when he knew you had them which I might add was every single day, I wouldn't dare go and see him on my twice daily visits without them otherwise he wouldn't 'talk' to me for a couple of days and gave me the cold shoulder, he really was that much of a character. At 24 years old it became clear that Ceasar's athritis was getting worse and he was having trouble when the cold weather set in and on 4th November 2011 we had to make the heartbreaking decision to have him put to sleep. That day was without doubt one of the worst days of my life. Having to say goodbye to Ceasar broke my heart and I'm not sure I will ever get over it. I miss him every single day. Some people may think this is a silly thing to say but he really did change my life and I will be truly thankful for every day I got to spend with him for the rest of my life and that is why I wanted to share this story with you and I hope you enjoyed it. Happiness & Heartache - My life with dogs. As a little girl I had a huge love and passion for animals which I have carried forward with me throughout my life up to today. I wanted all kinds of pets but I longed for a dog. I used to walk around the area where I lived asking if I could walk peoples dogs. Back then things were different (30 odd years ago) and the people were quite happy to have their dog walked. I ended up taking two particular dogs out very often, a red setter called Chloe and a white Jack Russell called Mitzi. I treated them like they were my own, in fact I think I did tell people they were mine! Lol. I would take them off all day and play with them, take them home, groom them wash them I just adored them. I begged my Mum & Dad but they would not shift an inch, my Mum used to say “ when you get your own house you can have as many animals as you like” how those words make me laugh now! My first dog of my own was Whoppit, the most adorable Jack Russell ever. He was around 5 years old when I got him. His owner could not give him the life and attention he deserved and I had already been taking him out lots in my van anyway. I loved Whoppit as if he were my family. He slept in my bed every night, he loved all my cats and he was so good and well trained. When I told him off he would grin showing the few teeth he had! After I had had him a couple of years he started to throw up his food quite a lot. I took him to the vets and after a few more visits and quite a lot of tests it seemed Whoppit’s liver was damaged. We never found out why or how. He was put on a special diet only available from a vet. Luckily back then I knew a Vet and she managed to get me the food in bulk at a cheaper price. Whoppit survived like this a further year or so and then on 23 December 1998 Whoppit passed away. To say I was devastated would be an understatement. The void this small dog left in my life was massive. After two months I could stand the loneliness no longer. My friend, Nicola called me up one day and said there was an advertisement in the newspaper for a 9 month old male Jack Russell. I agreed to take a look and she drove me over there, I left with Dinky! He was absolutely nothing like a Jack at all! He was dark brown and black long haired scruffy looking little thing, If you have ever seen the children’s program ‘Come Outside’ starring Pippin the dog, that is exactly what he looked like. There was just something about him that made me take him. The day after I got him home he started vomiting!! He was lethargic and would not eat. At first I thought it was because of the new home and move but as the days went on I realised it was much more than that. Off we went to the vets and after extensive tests it was revealed Dinky had Parvo Virus. He was put under electro lights and given various medications and the vet told me not to expect him to recover however, by some miracle he did pull through! He was one tough little dog. I had Dinky for 5 years. I loved him dearly. He was completely crazy, I’m not sure if anyone else would have put up with him! He wasn’t particularly well trained but this did not bother me at the time. This was all to change. In April 2004 I found out I was pregnant, the detail of this is unimportant but because I was on my own completely, I could not cope with a new baby and a crazy dog so I had to make the heart breaking decision to have Dinky adopted. I loved my baby of course I did but it was the hardest thing I have ever had to do. I will never forget the day my Mum picked him up and I said goodbye to him in the car, I was utterly devastated and heart broken. I had been in touch with a lovely lady, Janine who worked for the RSPCA. She had found Dinky a lovely home around 30 miles from where we lived at the time with a family who fostered children and had recently lost their dog. They also had another Jack Russell and Janine would occasionally update me how they were both getting along. It took me an awful long time to get over this loss and the guilt was horrific and suffocating. Over the next two years I brought my Son up and we got a beautiful cat, Fi-Fi and rabbits, Raisin, Buster and Peter but the huge gap of the companionship of a dog was always very apparent in my life. During 2007 when my son was aged 2, I started looking into the possibility of getting a dog. I did quite a lot of research and it was pointed out quite a lot of times that a Jack Russell might not be suitable with a young child in the house. After a lot of research and studying I decided a Labrador would probably be best suited to our situation. I kept a look out and one day there was an advert in the local paper for Labrador Puppies not far from where I now lived. I came back that day 26 October 2007 with George. He was 8 weeks old and a beautiful black Lab. He has turned out to be the most loyal, wonderful, kind companion to both myself and my son and I cannot imagine life without him and I dread the day we face this so we enjoy every single day with him. He was a nightmare at first, chewing shoes and things he shouldn’t, digging up my garden, my Mum and friends, which was even worse as he lived on a boat by a beautiful kept well known river bank. We were across the river having dinner at the time and I could see this black Labrador really going for it on this beautiful turf! He displayed all the puppy behaviour you would expect but now he is past all of that and the best friend you could ever want. Over the 7 years we have lived where we live now we have taken in unwanted pets of various kinds and as I speak we now have 4 cats, 4 hens, 1 duck, 13 rabbits, 4 guinea pigs, some fish and 2 budgies and of course our beautiful dog, George. 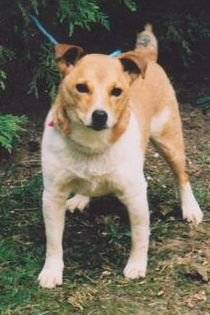 However, there has always been this little gap since way back 12 years and that is a Jack Russell companion. I have talked about the possibility of getting one for the past couple of years, mainly for obvious reasons I have already mentioned but I also thought it would be nice for George to have a dog companion as he always thoroughly enjoyed any of my friends small dogs coming round to play as George is still very much a playful dog even though he is 5 this year! I was advised by a friend of mine who keeps Jack Russells that no matter how well I trained the dog it would harm my small fluffy pets. I believed him but inside of me I thought I would be able to do it. I have mixed all my various animals all together and none of them have ever harmed each other, I’ve fostered various cats and look after rabbits when people go on holiday and still no one had ever come to any aggression. During the summer holidays in 2011 one of our cats, Flecks went missing. I knew this was bad as he never really went away for long and if I ever called him he would come straight away. About 3 weeks after his disappearance I found him. He had obviously been knocked down, not very far from our house. By this time he did not look like my cat but I could tell it was him from the flecks on his tail L A good friend of mine buried him right there at the spot he died and we put a picture and an artificial rose to mark it. It is still there today. Two weeks after this another of our cats, Cleo was knocked down directly opposite our house! I had only just fed her and as I stood looking at her shiny fur and perfect face it took me quite a long time to convince myself she really was dead. I received some money from my insurance for these two beloved pets and I thought to myself, right, that is it I am getting a Jack Russell and that is that! During September 2011 I spotted an advert on the internet for an 8 week old male, Tri-colour, Jack Russell puppy. It said he was the only puppy in the litter so had been very well cared for and very spoilt. This puppy had our name written all over him!! I called the number fully expecting him to be gone but he was still available. I drove over with my beloved George and we met the puppy. When I got there, there were ducks, geese, cats and dogs! Perfect! I took one look at this puppy and my mind was made up. 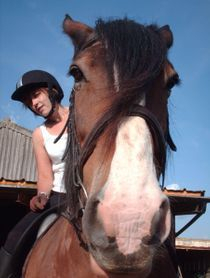 I bought Barney home on 28th September 2011 and he is everything and more that I have been waiting all these years for. He is so energetic, happy and lively and of course he is very naughty! He is wonderful with all my other pets. I introduced him immediately as soon as we arrived home and I have had him out there everyday with them. I did not make an issue of it all I just wanted him to realise this was all perfectly normal and they are all part of our pack. He looks up to George with pure admiration, he follows him in everything he does and much of what he has learnt has actually been from George! Two of my four cats do not care at all either way about him, one of them, my Ragdoll Purdy adores him, she plays with him and sleeps with him and the fourth cat Leo really does not like him. He hisses and tells him off if he so much as gets too near, it is actually quite funny to see. All my rabbits are in their pens so although he can see them he cannot get to them, apart from one of them, Peter. Peter is not one bit bothered by Barney, sometimes he will run away from him or sometimes he will chase him and attack him, other times they lay together in the sun. Barney is 8 months old now and we have just had him Neutered. He is everything in the world to us. My son loves him and he loves my Son. 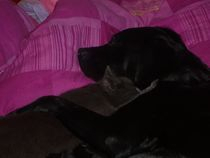 He loves to join in with the children playing and he loves to come and sneak in my bed J We have quite a way to go with proper training yet but he really does listen to everything I say. I can take him over the fields with George off the lead and he does all the main commands such as sit and get in your bed. We are looking forward to all the lovely years ahead with our animals and I feel complete now, especially with my Jack by my side.